Brown hair is the second most common on Earth, says Wikipedia, and Metro adds that one blonde girl colors her hair into a brunette every 20 minutes. This means that a huge part of the world’s population has brown locks, which can look truly gorgeous. One of the best things about this color is that it requires very little care. However, if you want your locks to be stunning, you’ll need to work for that extra healthy glow. Whether you dye your locks or have a natural brown color, you can enhance the shade and add some shine by using tinting products. This will be a healthier alternative to a comprehensive coloring treatment. Look for specialized shampoos and conditioners in the shades you like. If you need something ‘heavier’, consider using a semi-permanent hair coloring product or a specialized tinting treatment. Don’t discard natural methods, like rinsing your hair with coffee or a 1:1 mix of warm water and apple cider vinegar. The latter will make dull locks more shiny, while the former will make your brown color more rich and smelling divine. Soak your tresses in coffee for 20 minutes before rinsing off with cool water quickly. 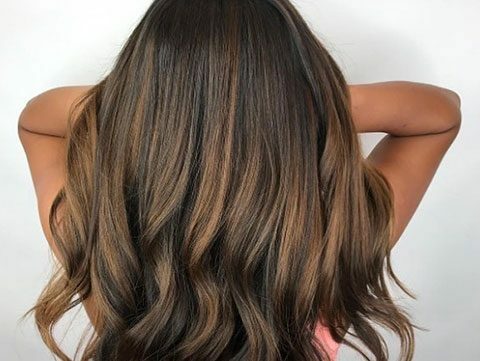 While bleached locks turn yellow naturally, brown hair (both colored and natural) is prone to developing copperish and even orange undertones. If you aren’t into this and want your locks to be the color of rich chocolate, you’ll need to apply anti-orange shampoo. This product is similar to purple-tinted shampoo for platinum blondes. But the colored pigment in it is blue and it specifically neutralizes orange present in brown locks, making them shinier and ‘more brunette’ at the same time. Brown hair might look a bit dull even if it’s perfectly healthy. Uniform colors tend to appear too ‘heavy’. You can fix this by adding a few highlights in a lighter shade. Choose the color carefully so the highlights don’t stand out. The effect you are aiming for is emulating a sun hitting your locks and making some strands lighter. This will visibly give your hairstyle more volume. Enhance this look with a layered cut. You can achieve the same effect naturally by simply walking around with your head uncovered outdoors. However, UV radiation from the sun is so dangerous and damaging for the scalp and hair that using a coloring treatment for highlights is the safer and healthier option. Any hair will be healthier if you wash it with nearly cool water. However, the state of your hair cuticles seems to affect brown locks more profoundly. That’s why this simple change can make brown hair shine immediately. If you can’t handle cold or even cool water, tone it down as much as you can. Heat is bad for the scalp and hairs alike. It’s particularly damaging for colored tresses as chemical pigments break down fast when heated. Hair glaze is a brunette’s friend as this product does not only add some artificial shine. These treatments condition the locks and enhance their texture, making your tresses feel and look like silk. Apply such a product once a week as a hair mask. Leave for about 20 minutes before rinsing off or follow the instructions on the label when applying every day. The effect should be immediate and improve with regular use. If you have gray roots, get yourself a specialized tinting powder or pencil and fix your locks every morning before going out. This will allow you to cut down on the frequency of coloring treatments. Take the product with you to reapply as necessary during the day.